How Do You Organize Ephemera? Ephemera — do you have enough? 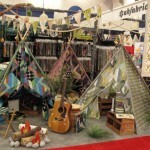 Do you do both paper and fabric? 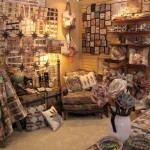 How do you organize your finds? I have been struggling to organize my ephemera in a usable fashion. I have a printer cabinet located in my utility room that contains 20 drawers filled with vintage ephemera … I rarely dive through its contents. I have 3 IKEA bins overflowing that I have been tryingto put into 12×12” clear folders, and sleeves. If you have any suggestions on how to store ephemera in a user-friendly way, please leave a comment below. 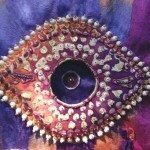 In return, your name will be entered into a drawing for a special ephemera package from my studio. Why all this talk of usable storage? 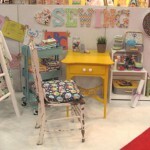 The goal was to clean off my studio work table of all the glue and paint, in order to have the space to use for fabric. 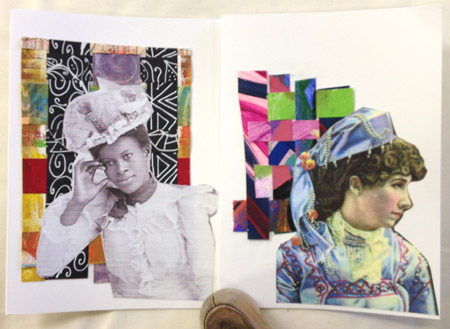 I have been trying to catch up on creating journal pages for our round robin and I have been on a card making kick. So to finish up this project, did I dig deep and pull out any of my stored ephemera? Nope! What I find myself really using are pint-size plastic bags that contain everything I have scraped off my table! 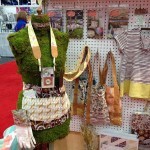 Any scrap goes into a bag, because for sure I can’t toss it in the garbage… it might be usable! In a previous blog posting, I wrote about how I created these cards. I still had more woven paper strips and wanted/felt I had to use them, so I went back and selected some additional vintage portraits to use. 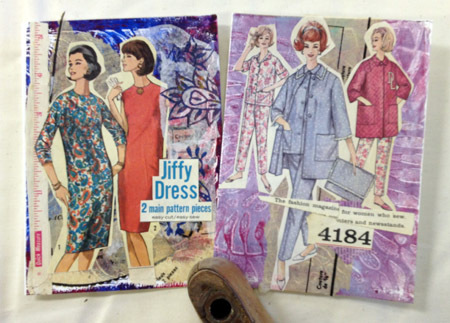 Last year in December I created mixed media collage cards (view post) using bright paints and vintage/retro sewing pattern illustrations, and I’ve made more in this style too. 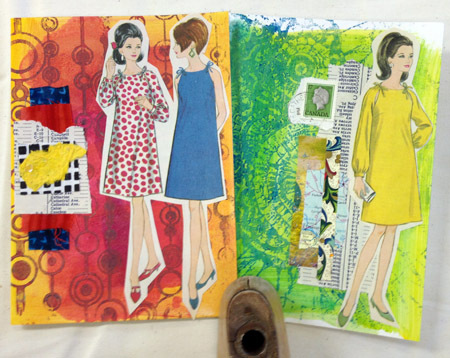 The backgrounds of the sewing pattern cards were printed on my 5" x 7" Gelli Arts Gel Printing Plate, and stamped using the great full page sized stamps by The Backporch Artessa (Kari McKnight Holbrook). Since our weather forecast for Christmas Eve is temperatures breaking a record and reaching the high 70s, maybe these are actually seasonal after all! Wishing you the same sentiments as one of the vintage ephemera downloads offered in our most recent enewsletter: a holiday season filled with prosperity, health and happiness! Please leave me a comment about your ephemera stash, your organization tips, etc. 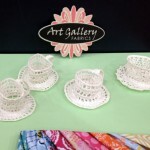 You might be the lucky winner of a package from my studio to add to your collection! In today’s enewsletter we included a product new to our online shop, Brush Crystal Colours…which were also the feature of our most recent How Do I Use This? program. 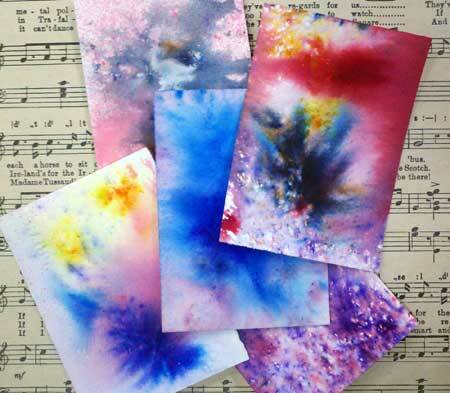 These vibrant watercolor inks in crystal/powder form are versatile and give you wonderful effects with ease. In addition to our own experimentation, we’re including some photos and links to other blogs that contain helpful info on using Brusho. 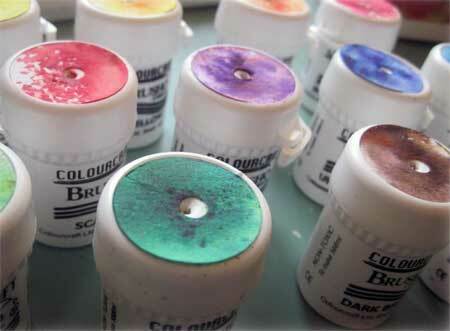 We would especially recommend visiting Dina Kowal’s blog “Mama Dini’s Stamperia,” as she includes comparisons and pros/cons of four different brands of watercolor powders…plus she links to a video tutorial she produced for Split Coast Stampers that thoroughly demonstrates a number of ways to use Brusho. Brusho arrives in a sealed plastic jar. Many recommend carefully transferring the powder contents to a container with a shaker lid; others punch one or more holes into the lid, as we did. We fell for the Brusho jar labeling technique used by Bibi Lindahl of Rubber Dance (her photo below) and copied it for ourselves. 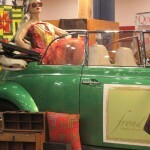 Smart, and pretty too…an unbeatable combination! 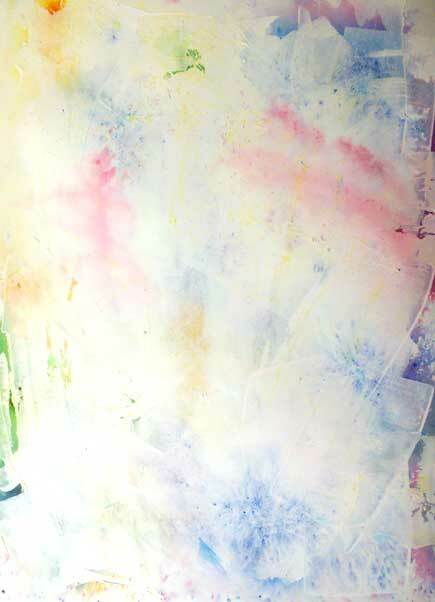 Using Brusho couldn’t be simpler: simply sprinkle a few grains of one or more colors onto a wet substrate: watercolor paper, mixed media paper, canvas, fabric (more on that below). 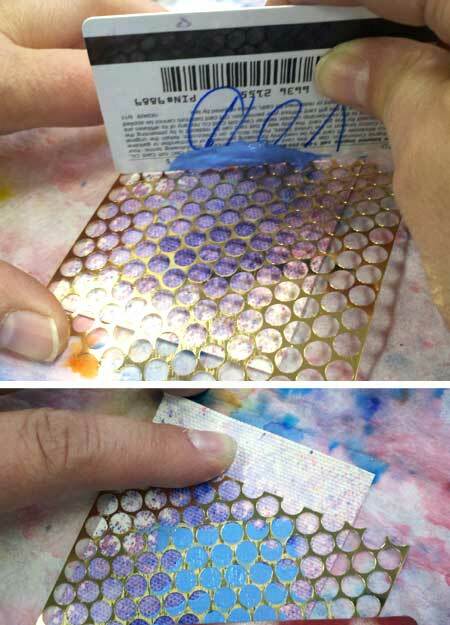 Most of our samples are watercolor papers cut to ATC size. 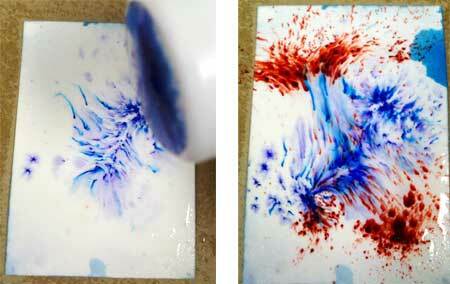 Above, left, you will immediately see the color react to the water and begin to spread. Just a tiny amount is needed…you can get somewhat misled by that instaneous nature, but rather than using additional shakes of product, give it more time to react. 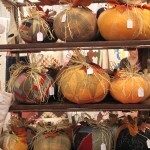 You can also sprinkle the Brusho onto a dry surface, and then spray with water, as above. 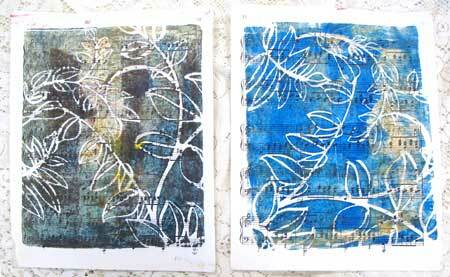 Results differ a bit between these two methods, so experiment with both to find out how you like the effects. One of the reasons we chose to stock Brusho over other brands was that it is available in 34 beautiful colors, including a black and a white. All colors are fully intermixable, and with a black and a white, your shade/tint possibilities are even greater! Brusho colors are created using a multitude of different color crystals, and you will see those different colors bloom and react. 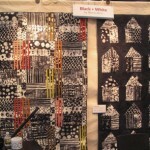 When we first sprinkled on the black to create a test swatch (shown here, right), we actually gasped! 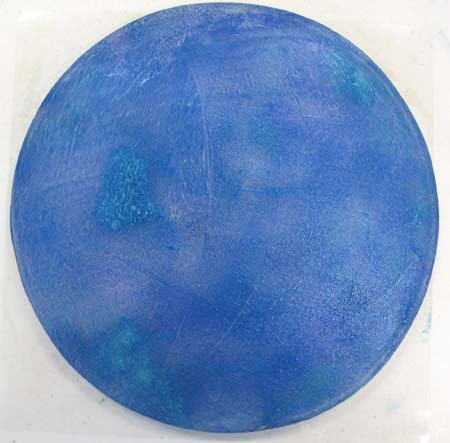 Add a bit of the Brusho crystals into a small amount of water to dissolve, then add additional water to the desired strength, and you have your own custom spray ink. 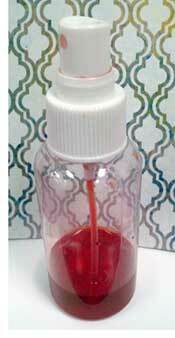 We diluted the Brilliant Red to make a pink spray you can see on several of our examples. 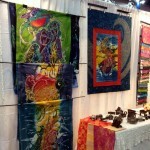 Brusho can mix and dissolve with any water-based medium. 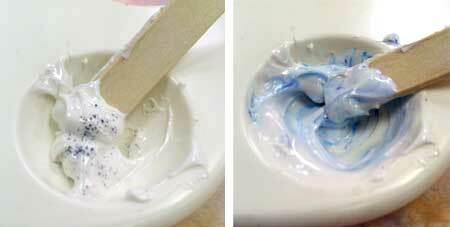 Add it to any acrylic medium to create a heaveir-body paint. 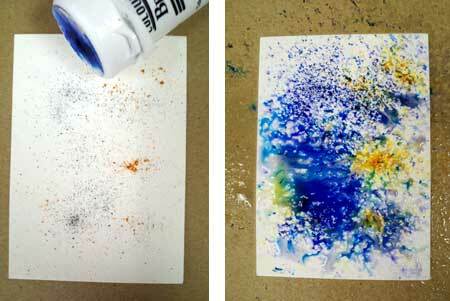 We enjoyed mixing a few custom colors of molding paste and adding texture to some of our cards through sequin waste. Again, just a small shake of Brusho gives you a lot of color! 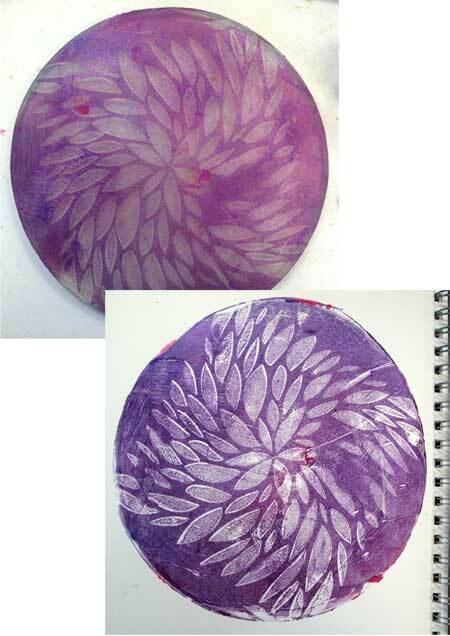 Above, in the yellow tag example, you can see that the underlying Brusho Crystal Colour “seeped” up through the paste to give it even more color and texture. Below, you can see a similar effect: we gessoed over a fully colored mixed media paper journal page, and love how tints of the underlying colors came through in varying intensities. We also experimented with stamping onto our blank cards with clear embossing ink and using clear embossing enamel to create a resist for the Brusho. 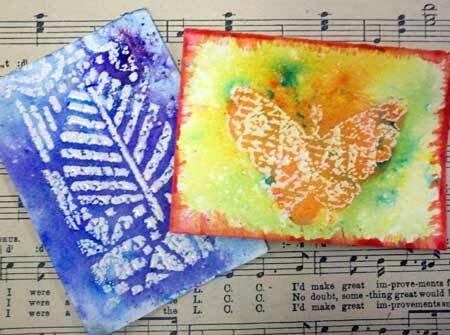 The butterfly example below also shows the mixability of the colors: the outer border was a mix of red and yellow powders in a bit of matte medium to create a paint. One of the “rules” for our Thursday evening How Do I Use This? 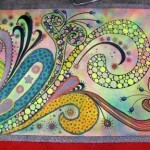 sessions is that anything you can do on paper, you can do on fabric. 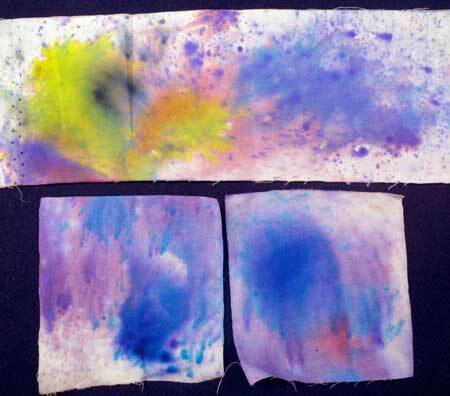 Below, top, is a strip of 100% white cotton that was spritzed with water and sprinkled with Brushos. 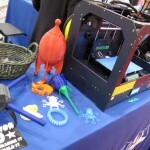 Very cool…but what about permanence? 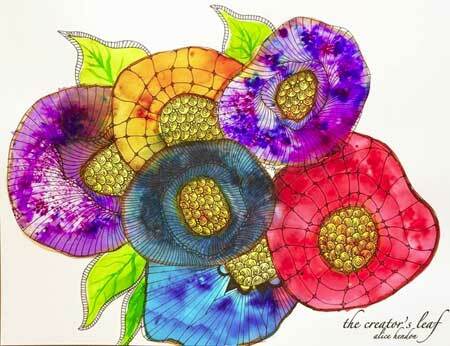 She also created a blog posting featuring color swatches of 32 of the Brusho colors, showing off side by side how each appears on two different types of paper, Neenah 80lb cardstock and Fabrino 140lb watercolor paper. P.S. While we haven’t yet explored this method, Brusho can be used to add tints to wood and is a great way for you to preserve the grain pattern, as it creates strong, but transparent color. Colourcraft recommends choosing a light-colored, close-grained wood to start, with the following steps. Dampen the wood, dry and rub back before application (to minimize the stain raising the grain. 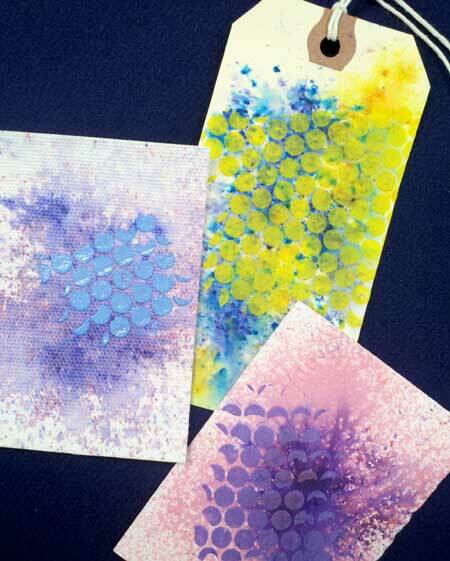 Mix Brusho colors and apply very sparingly with brushes, cotton gauze or an air brush. 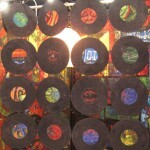 Stained wood can be sealed with a polyurethane or acrylic varnish. 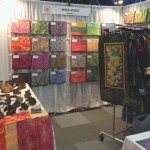 In the quilting/fiber industry there are two events dedicated to wholesales/retailers per year. One in the spring, which moves around the country at different venues, and one in the fall. 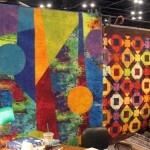 The fall Quilt Market is always held in Houston, Texas and precedes the International Quilt Festival,, the exhibit and shopping event open to the public. 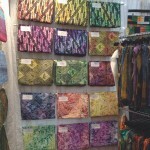 During Quilt Market we shared our new exclusive batik and Combanasi fabrics with stores and other businesses who were searching for new lines, then we rearranged our booth to welcome the public there for the Festival. 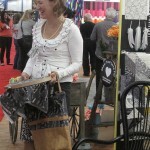 I wanted to try and find the time to share photos and details about the two shows, but it was crazy-busy (not complaining!) and I didn’t end up having the opportunity. But now that I’m home, I wanted to share some of my impressions. 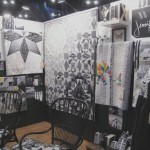 The photo gallery below are of products and displays that caught my eye, quilt samples by fabric and design companies, or people we know. 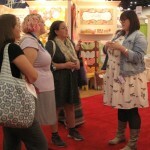 I hope it gives those of you who weren’t able to attend a bit of the flavor of Quilt Market. 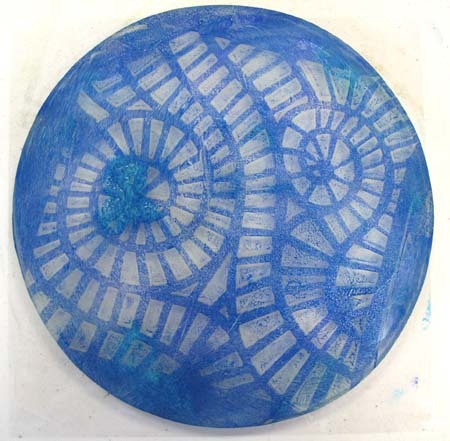 Why Do I Need a Round Gelli Plate? 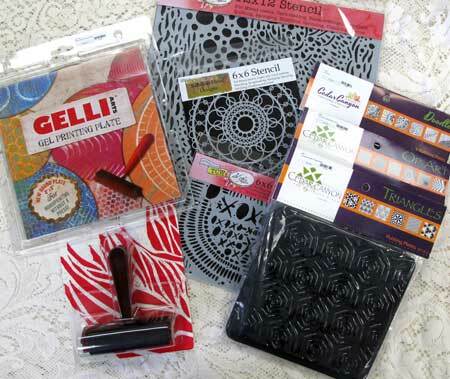 As I watch the different sizes of Gelli Arts™ Gel Printing Plate arrive in the shop, I wonder why we need different shapes and sizes. Do I really need one of each size? Well, after experimenting, I must say yes. Especially to the 8" x 8" Round plate! Why? Because! 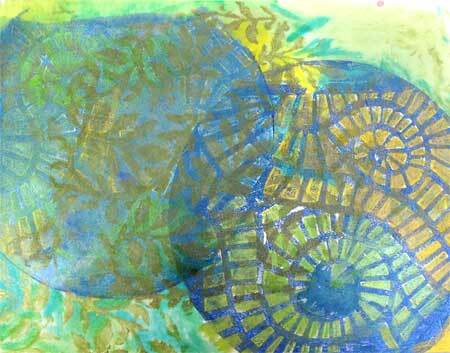 p style=”text-align: left;”>On my Gel Printing Plate I have placed three different colors of paint. 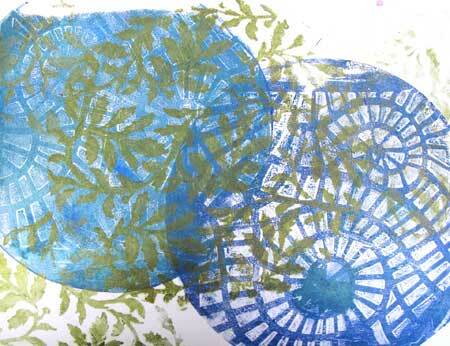 After dabbing them on, I use a brayer to even out the coat of paint on the plate. When brayering, sometimes you will see the colors stay somewhat distinctive; other times they blend together to create a completely new color, as in the below example. 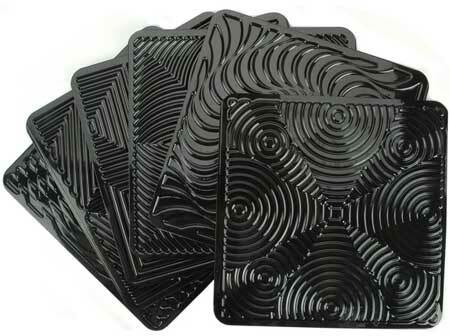 Cedar Canyon Rubbing Plates are sold in sets of six and are created from a lightweight black plastic that is deeply embossed with patterns. 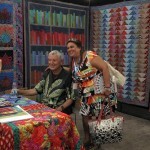 They are available in a number of designs; pictured below is Op Art. 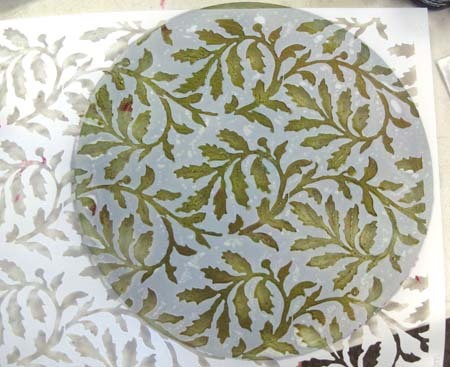 Select a rubbing plate, and lightly press it onto the paint-covered gel printing plate surface, then and lift straight up. 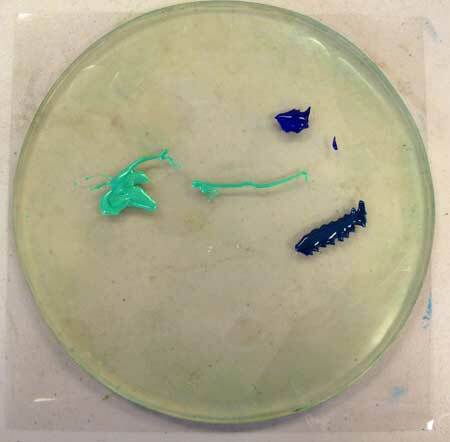 Below is the plate with paint “removed” from one of the rubbing plates from the Doodles set. 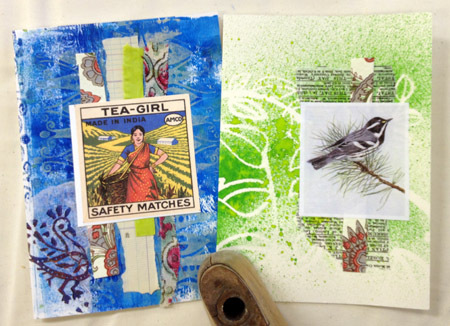 Pick up your printing plate and place it face down atop one of your journal pages. Notice below how I have offset it so it “bleeds” off the edge of the page. Below, I added another circle to the same page. 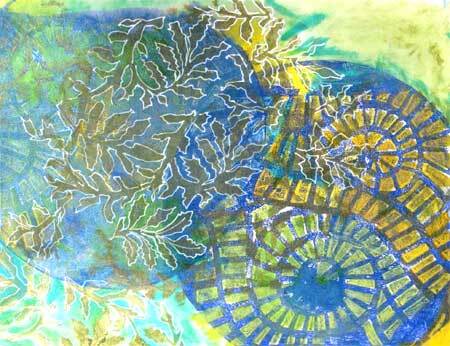 Another rubbing plate print, this one of the plates from the Floral Fantasy set… does it look like it is twirling to you? 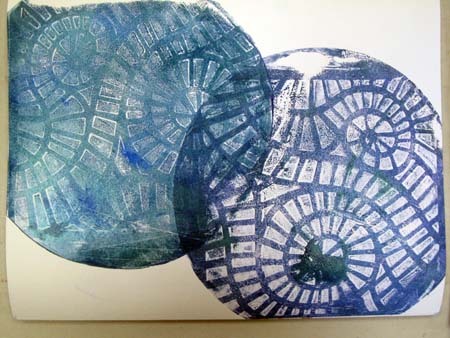 Below, the gel printing plate coated with paint and my free-handing a design. I think I need additional practice with free-hand pattern making. 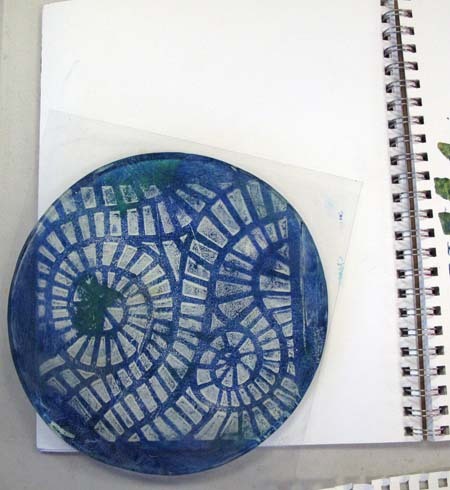 Another great tool to use with gelli plates are stencils. 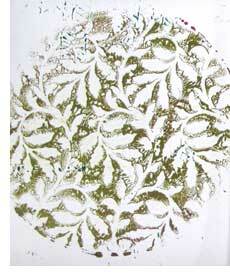 In this example I used a large 12" x 12", which allows me to continue the pattern right up to and over the edge. 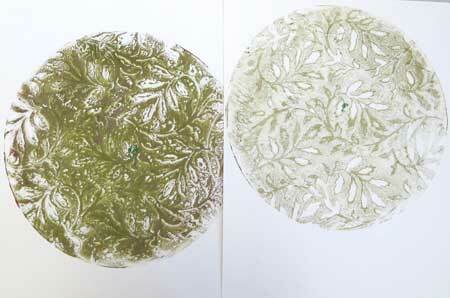 Here are three green monoprints, all using the same stencil. 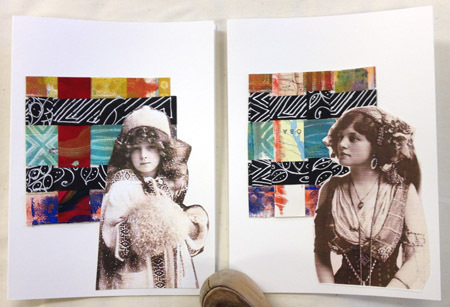 Of the two that are pictured below, I think the one on the left had too much paint applied to the Gel Printing Plate. 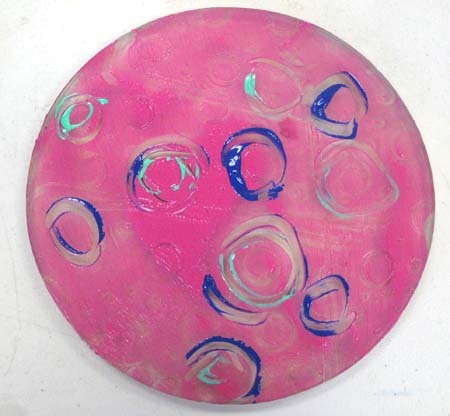 It does take some trial and error time and practice to get the application of paint onto the plate correct. But it’s not exactly torture to spend time playing! Up to this point I haven’t written about the paint I am using. 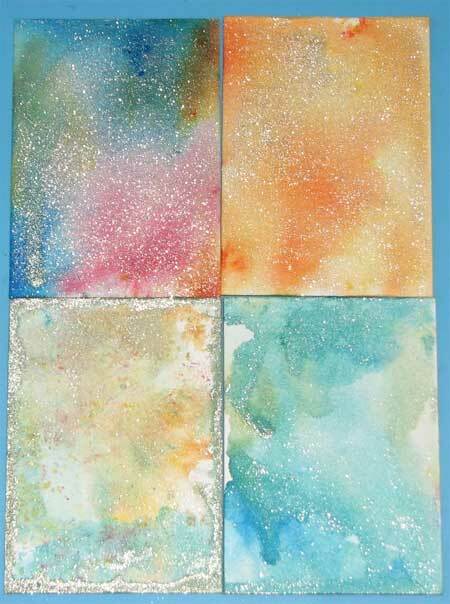 Silks Acrylic Glazes have a high mica formulation and give you a nice finish shine …not too much, but just right. 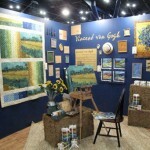 They are translucent and designed to blend over any other Silks shade without going muddy. The other cool thing about these paints is that once dry, they act as a resist to combining with Twinkling H20’s, which are a watercolor. 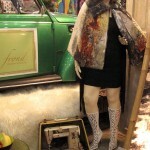 Again, the colors stay true and jewel-like. 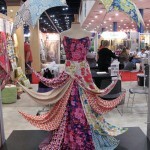 Below is the above print with the addition of additional Silks and Twinkling H20’s. 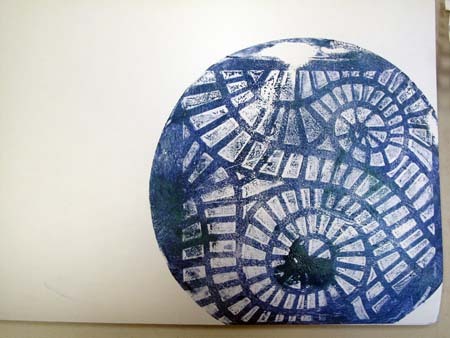 So, I have I talked you into “needing” a round Gel Printing Plate too? 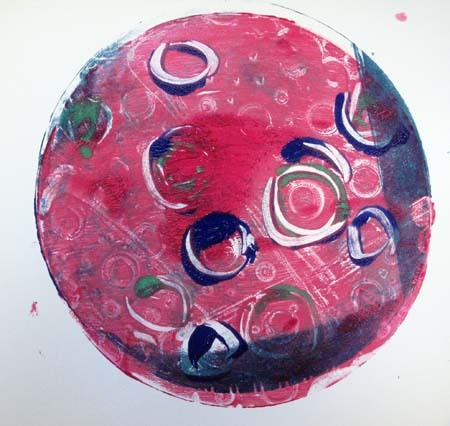 If you’re interested in exploring monoprinting, I heartily recommend our upcoming class, Gelli Printing on Paper with Susan Gantz. 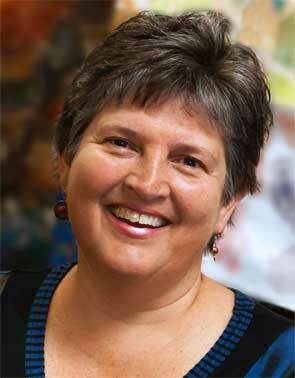 Susan is an amazing teacher who loves to share her enthusiasm for this amazing art form. 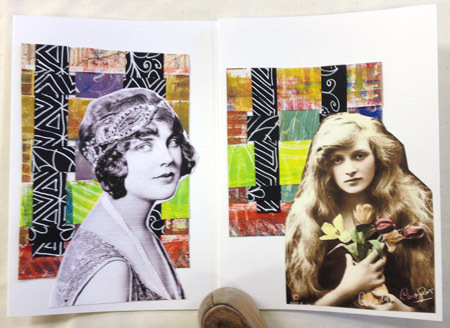 Plates, paints and more are provided, and we have heard nothing but raves about this class…every student walks out with a sheaf of amazing monoprints we all oooh and ahhh over! But since our agreement to participate in this huge shop hop means we are unable to publish our Springtime Flora & Fauna pattern until this fall (after Row by Row ends), I came up with another piece to illustrate Rayna Gillman’s wonky strip piecing technique, a key design feature in our row. 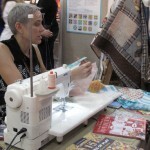 I learned how to embrace rotary cutting without the rulers from reading Rayna’s book, Create Your Own Free-Form Quilts: a Stress-Free Journey to Original Design. If this technique interests you at all, I heartily suggest buying the book…for one, I can assure you her diagrams are much better than mine! Plus what I am about to show you is only one portion of the book, which is an amazing modern/art quilt reference I often recommend. At Artistic Artifacts we have recently received a new shipment from Indonesia of wonderful Batik Panels by our artist friend Jaka. 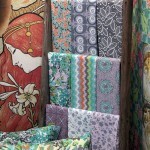 He creates imaginative designs, especially people: from women with an attitude to family settings, and village scenes. 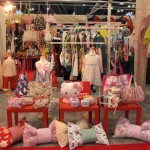 I have named the panel that caught my eye for this project 2 Girl Friends; it can be purchased from our online store. 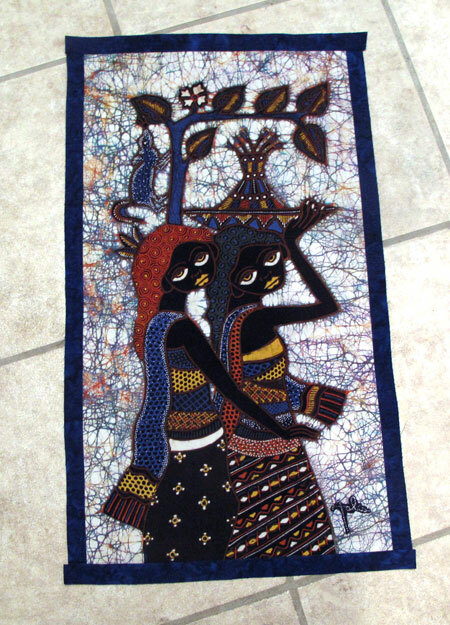 I knew immediately that I would put an inner border using a beautiful royal blue batik, and it looked wonderful with the panel colors. 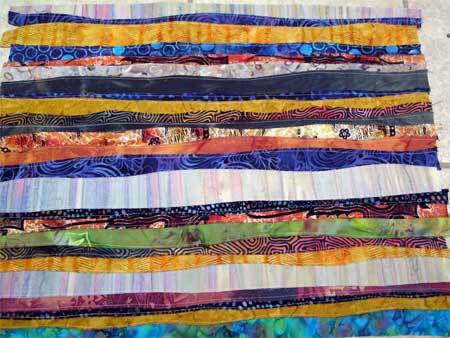 Next was the strip piecing. 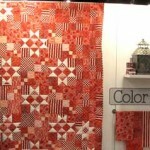 Rayna encourages you to use leftover pieces of fabric that have already been cut for other quilt projects. But if, like me, you don’t have enough long strips hanging out in your stash, simply pull a variety of fabrics and cut strips. 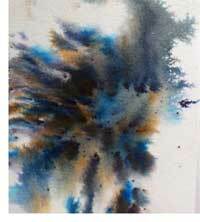 For this project mine are approximately 18 to 22″ long and 1¼" to 1½" wide. 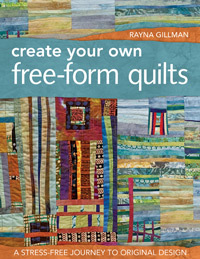 In her book Rayna recommends as a guideline initially working with strips that are 8" to 15" long and from 1" to 3" wide. 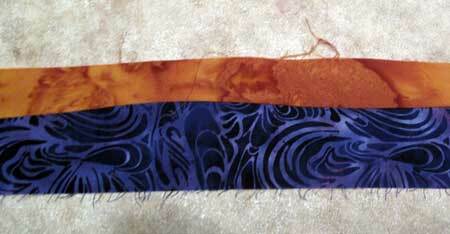 Here I have two strips ready for the process. 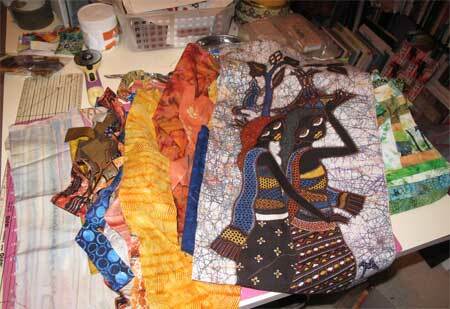 My selected fabrics that have been cut (or torn) are placed, both right side facing up, with a slight overlap. 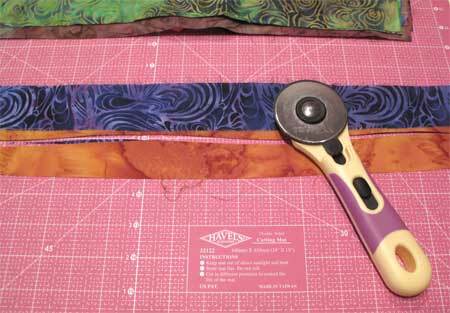 Cut a gentle curve with your rotary cutter along the overlap. You are freehand cutting, no ruler needed! 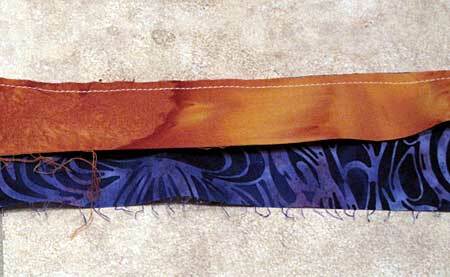 The sliver of purple showing underneath the orange, and the orange showing under the purple, are pulled away and not used: you will have a two strips with matching curves. This part can be a bit tricky. 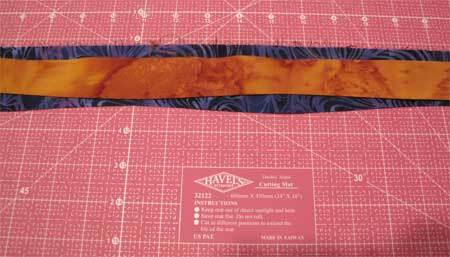 When your two strips are placed, right sides together, to be sewn together the curves do not match up (as seen in the below photograph). 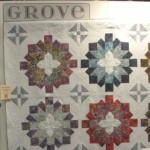 If you have ever sewn a curved quilt block, such as a Drunkard’s Path, you will already be familiar with this concept, but if not, you have to pull the convex and concave edges of the fabrics together to be able to sew a seam. 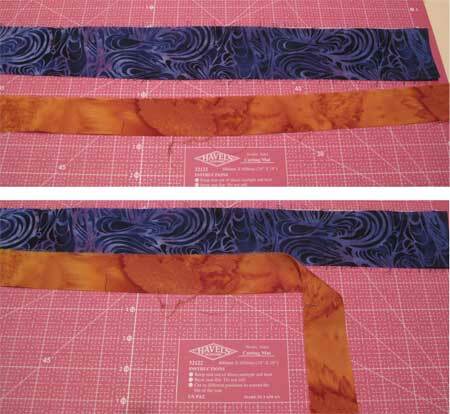 If your curves are gentle, this can be done by hand while you are at the machine, but if you don’t feel comfortable, pin the strips together to have the “peaks and valleys” (as Rayna calls them) match up. If you haven’t previously sewn curves together before it won’t seem as if they will seam together flat, but they will! 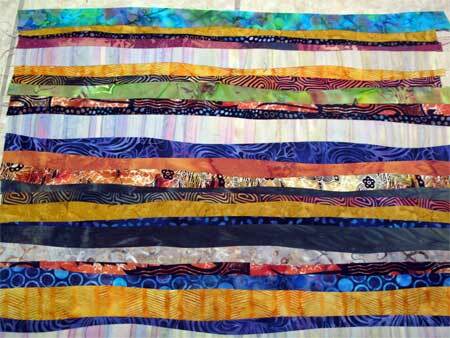 Above, two wonky strips sewn together. Notice the imperfect seam allowance! In her book Rayna teaches you that you don’t always have to aim for a 1/4-inch seam allowance, that between ⅛" and ¼" is fine. I tested any of my seams that looked thin by gently pulling them apart; if the seam did not hold, I just stitched over it again. Below, the front side of my free-form strip segment. One strip attached, many more to go! But these go together quicker than you might think, and it’s fun piecing because there’s no stress…imperfection is your goal. Below, my completed unit of free-form strips. From this, I then cut bands that I used to border my panel. 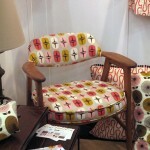 And just in case you want to see this from the back, I’ve included the photo below. I pressed all of my seam allowances to one side. 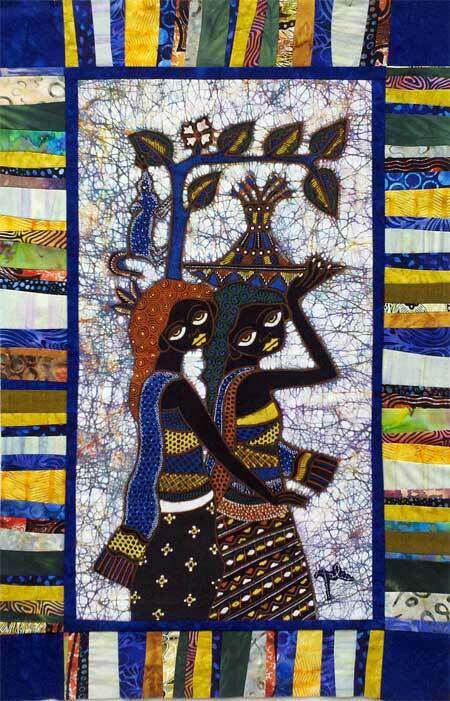 while you are stitching, you don’t worry if some are longer than others. Using Rayna’s method, the only time you use a ruler with your rotary cutter is to trim square those strip ends and to cut strips for borders (as I am) or blocks for precise piecing. 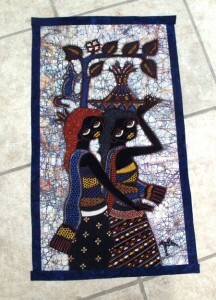 Below, here is my completed 2 Girl Friends Jaka batik panel with strip piecing edging. 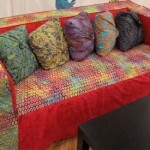 Well, completed without being layered, bound and quilted! Click on the photo for a larger view.